The first Wyoming County Fair was held in 1857 in Eaton Township, the current location of the Walmart Super Center. The fair was held to promote the county and its agricultural products, and the opportunity for local farmers to get together and relax after the summer harvest. The fair ran for 44 years before World War II came along and after 1942 the fair was forced to close because of the war and lack of money to continue. The Tunkhannock Kiwanis Club decided to revive the fair in 1985 when President Joseph Gorman added the fair to their 12 projects list and scheduled the opening for 1986. With the old fairgrounds occupied, the Kiwanis Club searched the county for land to locate the fair. Starky Bartron offered the fair use of his property in the rear of Bartron Supply, along Route 92. Hughey Trucking, Department of Agriculture, and Bocar made their property available for parking, and thus the fair was revived in 1986 and remained at the site through 1990. Their yearly motto...BIGGER AND BETTER each year were realized as vendors, exhibitors, 4-H exhibits, and open Ag expanded. 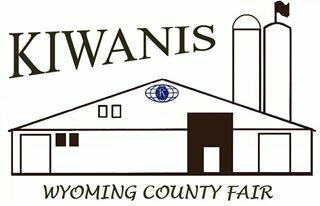 The 1991 fair was moved to Meshoppen when the Kiwanis Wyoming County Fair decided to make a financial decision to purchase 231 acres of property along Route 6 in Meshoppen. The total cost was $247,000 and the fair committee only had $5,000 in the treasury, but decided to borrow the money and purchase the land that included a cattle barn, storage barn, and two homes. Fair volunteers spent countless hours and a ton of money to level the ground, repair the buildings, provide electric service, water, blacktop, fences, and parking facilities as the fair went big time, expanding all the facilities, booking big name entertainment to supplement the local bands, dance groups, and choirs. The fair's ONE PRICE PAY ALL really took off with the - FREE RIDES, FREE ENTERTAINMENT*, AND FREE PARKING. By the time 1992 rolled around all the livestock exhibits expanded beyond all expectations. The open Ag and 4-H areas were moved to a new area, behind the newly renovated building. Horse pulls and tractor pulls were added, along with picnic tables and benches. The fair ended the 1992 fair with a big display of fireworks to mark the 150th Anniversary of Wyoming County. A new dairy and sheep barn was built in 1993 and the future looked good until February 13, 1994, when a big snow storm piled and drifted on the exhibition building. The weight was too much for the building and a third of the building roof collapsed destroying an exterior wall and electrical service. Improvements were put on hold until the building was completely rebuilt, and a new roof and repairs costing $100,000 was completed, as a massive volunteer effort from all over the county rallied to the fair's rebuilding project. Donations, grants, equipment, materials, and volunteers made it happen and the project was completed. Since that untimely disaster, much has been done. Another barn was built next to the dairy barn. George Gay Farm Museum was opened, later expanded, and expanded again in 2013. A new barn was added in memory of local horseman Tom Sands; 40 stalls were added. A new stage, one of the biggest in the area, was completed. A new information center, horse arena, and grandstand bleachers were installed in 1996 followed by a sheep barn and a second entertainment stage. Ten local merchants and volunteers built their own permanent buildings in 2000 and another ten have been added. A $15,000 grant from the USDA Forest Service has allowed us to plant 131 trees, along with several gardens on the fairgrounds that really adds to the fair's beautiful views and looks. Paving walking areas were added, along with parking lights, more tables, bleachers, and landscaping. How did we accomplish all this within a short period of time??? LET US TELL YOU!!! All the success of the fair was made possible by donations from local businesses, organizations, grants, and 300 local residents who purchased $1,000 non interest bearing SUBVENTION CERTIFICATES. These VIP CERTIFICATE HOLDERS receive 12 daily passes, and VIP parking each year. These certificates automatically renew after ten years or can be converted to Life Honor Certificates that provides the same benefits. They made it possible to renovate the buildings, level the grounds, build new buildings, and make it possible for all the local vendors or exhibitors to sell their food and merchandise to fund their clubs, churches, and businesses. WE WILL NEVER FORGET THEM. Wyoming County will always be proud of all involved in running the fair and the more than 900 volunteers who always respond each year to make the fair successful. Lastly, we are indebted to the Tunkhannock Kiwanis Club who in 1986 made the revival of the fair their 13th project, and each and every one of the 60,000 fairgoers who support us. *Main concert events are not included with the free entertainment.